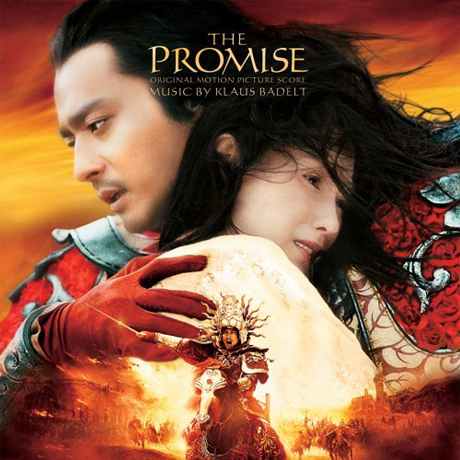 So, here’s a statement you won’t see me make very often: The Promise is the best score of Klaus Badelt’s career, and one of the best scores to be released in the first half of 2006. As I have written on many, many occasions, one of my favourite styles of film music is the combination of a western orchestra with solo performances by Chinese instruments, and Badelt’s score for director Chen Kaige’s visually sumptuous film is the latest to join a long and distinguished list, along with the likes of Rachel Portman’s The Joy Luck Club, Conrad Pope’s Pavilion of Women, Basil Poledouris’s The Touch, and Tan Dun’s Oscar-winning Crouching Tiger Hidden Dragon. The film is the latest entry in an increasingly popular sub-genre of films, the ‘Chinese historical action/fantasy’, which to date has included such popular and financially successful efforts as the aforementioned Crouching Tiger Hidden Dragon, Hero and House of Flying Daggers. It’s a fantastical parable about a Chinese princess named Qingcheng (Cecilia Cheung) who makes a bargain with a goddess – in return for everlasting wealth and beauty, she agrees never to have lasting true love. Every man she falls in love with will die. When she is attacked by the forces of the evil Wuhuan (Nicholas Tse), Qingcheng is rescued by a heroic warrior, who she believes to be General Guangming (Hiroyuki Sanada). In reality, her hero is Guangming’s servant Kunlun (Jang Dong-Kun), wearing his master’s armor, who has fallen in love with the princess, despite knowing the extent of her curse. However, when Qingcheng pledges herself to be Guangming’s queen, Kunlun is driven mad with love, and disappears into the wilderness, where he is taught mystical, magical powers by the mysterious Snow Wolf people. Years later, now a fearsome warrior himself, Kunlun returns to claim the hand of his true love – but finds himself vying for her affections with both Guangming, and the evil Wuhuan, who wants the princess as his slave. The film was nominated for a Golden Globe as Best Foreign Language film in 2005, and is the most expensive Chinese film ever made, with budget of 282,572,490 yuan ($35 million). It’s difficult to know where to begin to describe Klaus Badelt’s excellent score, because there are just so many great things about it. One of the most remarkable things is that he was hired to score it in the first place – because, let’s face it, his career to date has hardly been littered with enormous, sweeping epics, or even smaller-scale scores which could lead you to think he would be capable of writing something as magnificent as this. The Promise is about as far removed from the anachronisms of Pirates of the Caribbean or the banality of The Recruit as it’s possible to be. The performance by the Chinese National Symphony Orchestra is superb, sounding on a par with the best that Hollywood or London has to offer. The size of the orchestra sounds enormous, often reaching monumental and epic proportions, especially in the action sequences and during the more sumptuous performances of the themes. Possibly best of all, however, is that Badelt has dispensed with his synthesisers almost entirely – only the most subtle electronic embellishments are detectable anywhere in the score, and even then they are only for atmospheric effect, or to add a different percussion texture. It’s impossible to underestimate just how much of an improvement over his previous work this is. The opening “Freedom of the Wa” is simply stunning, featuring the unique, croaky, but totally mesmerizing performance of vocalist Hang Yue, intoning a highly-stylized but undeniably effective Mandarin song over the massed ranks of the orchestra. The action music, which features heavily in cues such as “Save the King’, “Saving a Princess” and “Stampede” is powerful and emotionally charged, making great use of the brass section, which throbs and pulses for the duration of each cue, and quite often carries the melody too. The contribution of master orchestrator Robert Elhai is quite apparent in these moments. Once or twice there are stylistic echoes of some of the more swashbuckling parts of Pirates of the Caribbean, but on the whole Badelt eschews the simple, crowd-pleasing rhythmic devices of that score, and attempts something more artistically challenging here. There are also many clever instrumental touches worth mentioning: the cimbalom which adds a touch of mysticism to cues such as the “Love Theme” and “Feather Fight”, and several interludes featuring the deliciously evocative dizi bamboo flute, most notably the moody main theme, “Wuji”. The haunting “Snow Country” features a totally unexpected, but magical choral element, combining Yue’s tortured tones with a children’s choir. The overall effect sits on top of, rather than within the orchestral performance, but complements it wonderfully well. However, possibly the most impressive thing about The Promise is the fact that it is a many-themed, multi-layered work which never stops being interesting, continually offers something new, and maintains its momentum for the entirety of its lengthy 73-minute running time. Each main character in the central love square – Kunlun, Qingcheng, Guangming, Wuhuan – has a fully-formed, independent, clearly distinguishable theme, underscoring their nature and actions. “Kunlun, the Slave” is bittersweet, melancholy, but defiantly hopeful, building from a gorgeous erhu solo to encompass the full might of the orchestra, complete with cymbal crashes and wave upon wave of rolling gongs. The astounding recapitulation, and subsequent delicate deconstruction, in “Come Back” is heartbreakingly beautiful. “Qingcheng, the Princess” is quieter and more introspective, anchored by the more western element of the violin section. “Guangming, the General” is a power anthem which Zimmer would be proud to put his name to, a driving martial march with thunderous horn performances, accompanying fanfares and flourishes, and dramatic percussion. “Wuhuan, the Duke” has a sly, slightly dangerous, but darkly romantic quality, featuring more prominent cellos. Throughout the entire score, these four themes weave in and around and within each other, illustrating the complicated romantic paths the protagonists take, and bringing their stories to life. Of course, it would be impossible not to make comparisons with Dun’s pair Crouching Tiger Hidden Dragon and Hero, and Shigeru Umebayashi’s House of Flying Daggers, as these films and scores are quite obviously the inspiration for The Promise. However, in terms of pure enjoyment, I feel that The Promise is the best of the four: it offers more in the way of satisfying thematic content, more interesting and varied orchestrations, and has a significantly heightened emotional element which makes it more appealing, at least to me. I lost count of the number of times I felt goose bumps, or became lost in a private moment of awe while listening to The Promise. The 8-minute cue “The Robe” and the 10-minute finale “Wuhuan’s Plan” are worth the price of the album alone. The Promise is a perfect example of what Klaus Badelt is capable of when he leaves his synthesizers at home and writes music for a full, clear, lush symphony orchestra. Quite where this leaves my evaluation of his career as a whole, I don’t know. I still feel that, for the vast majority of the time, Badelt relies far too heavily on his synths and samples, and has tendency to go for the easier route when scoring films which don’t really inspire him. The Promise, however, more than illustrates that Badelt is perfectly capable of musical brilliance when the mood takes him; I sincerely hope that, off the back of this work, the mood takes him more often. As it stands, this score is absolutely, unreservedly, enthusiastically recommended. Music composed Klaus Badelt. Conducted by Li Xincao. Performed by The Chinese National Symphony Orchestra. Orchestrations by Robert Elhai, Jeff Toyne, Ian Honeyman and Andrew Rather. Special vocal performances by Hang Yue. Featured musical soloists Liu Huanan and Li Chuanyun. Recorded and mixed by Steve McLaughlin. Album produced by Klaus Badelt and Christopher Brooks.